At the top for easy access! Well, I am confused! We’ve got the elusive banana stem, a substitute (aka lotus root) and now (in some comments) lotus stem, too. When I saw that, initially I was thinking lotus root (actually a rhizome, I learned) and lotus stem were different parts of the same plant. A little further reading and I am still unsure — wiki states that the ‘rootlets’ are pickled — but here’s another source showing pickled lotus flower stalks! Is a stalk the same as a stem? That makes sense — but what about a rootlet?? Baby root, yes? no? sausage link when whole, when cooked is fairly bland, something between the texture of a potato and a water chestnut. I’ve seen it in Chinese restaurants, usually in a mixed veg dish such as “Buddah’s Delight”, and and also in Japanese cookbooks (where it is called renkon), stuffed and sliced. See this informative post for more, and an excellent photo. 2. lotus stem — which I bought once in the Thai section of an Asian market, in a jar, pickled — it was thin, white, and as I recall, very vinegary, crunchy and fibrous. 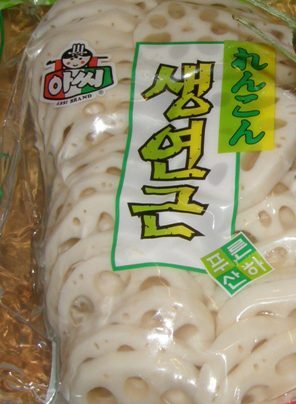 Not at all like the rather bland lotus root, and I have never seen it in a restaurant. See this tasty-looking recipe with a great photo of the little babies — called ‘rootlets’ in the post. And check out that salad — with green jackfruit no less! Sounds interesting. One of the most appealing things about Nupur’s year-end recipe marathon is the chance to go back over old bookmarks. I am having a blast revisiting these, as well as old posts of my own — many of which I haven’t seen in years. 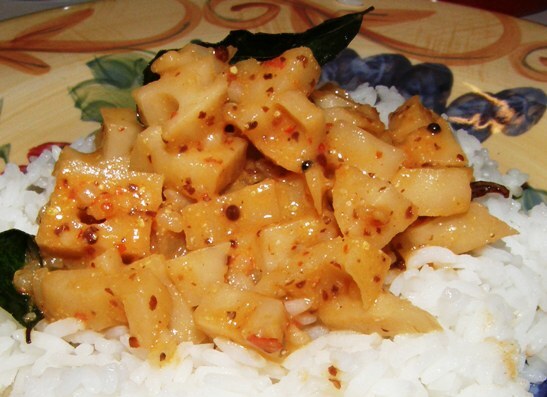 Today I came across this old lotus root post of mine, and this tasty-looking recipe from Vini. For months, I wished and hoped for a green mango. It took me nearly a year to find something close. but mostly I use frozen. When I found breadfruit, it was canned (well,ok… jarred). I also wanted to use this marathon as an opportunity to cook, as much as possible, from stores already on hand. Looking at these two old posts, and then looking into my veg. drawer, I had an inspiration — perhaps lotus root could substitute for banana stem! Reading Vini’s excellent description of banana stem once more only confirmed the hunch — “porous, absorbs flavors, retains crunchiness….” — hmmm! It might not taste exactly the same, but it just might work. The experiment was a huge success. Take the cover off simmering lotus root and you get a wee wafting hint of potato, but this won’t fall apart on you as potato can. Lotus root retains much of its crunchy texture; all in all a very interesting little tuber. As for the mustard paste — I couldn’t begin to describe the aroma; and I couldn’t get enough. Tantalizingly pungent yes, but not overly so — tangy, heady, spicy-amazing — this reminded me why I appreciate having the time to cook from scratch. And who would have thought tamarind would make the difference — I hardly had enough left for a decent photo with rice — I kept going back for ‘one more taste’. ~ I used rosematta rice as that was handy. While the type of rice wasn’t specified, I imagine the short soaking time combined with the heartier rice made for the little pleasantly crunchy bits in the ground paste. ~ Obviously, I replaced the elusive banana stem with lotus root! 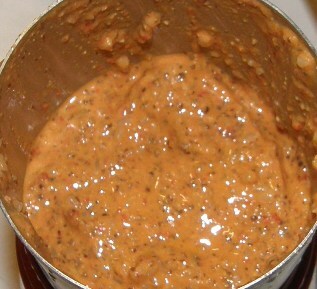 Here are a few pics; for the real recipe please visit A Whirl Of Aromas! my very own dried chilies! 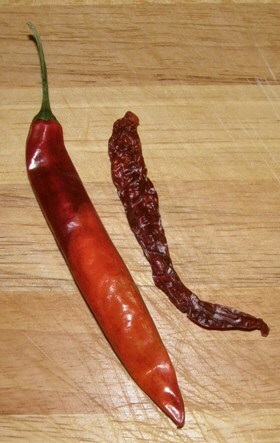 my dried chile doesn’t look as appealing as the store-bought! 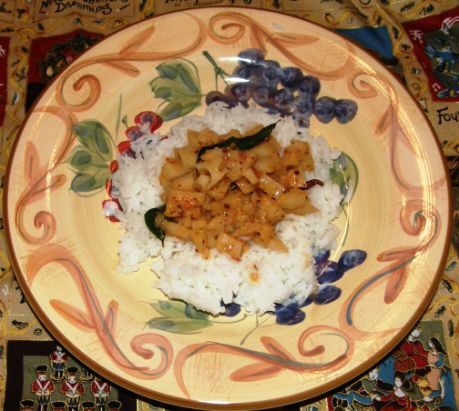 not banana stem curry, but it sure tasted great ~ thank you, Vini! I love the ease and convenience of this, my current fav tamarind paste in a jar ~ when I don’t want to soak and squeeze this is what I turn to ~ what about you? Your chilli’s look great!! I think you have to dry them more this summer, to make them look like store bought one’s. I love this post! 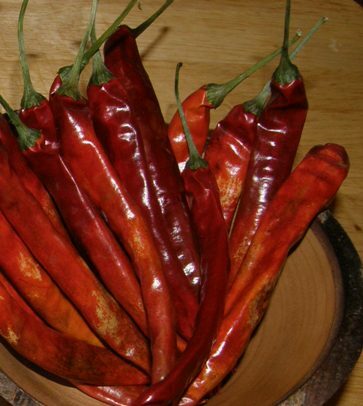 I think your dried chillies look way prettier than the store-bought ones. I know just what you mean about the off-beat vegetables. Lotus stem is something I have yet to try. 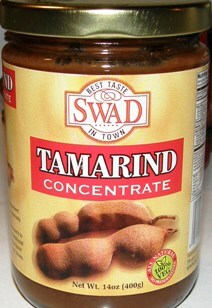 About the tamarind, I tried this jarred tamarind paste (the very same brand) last month but just did not think it tasted the same as freshly soaked tamarind so I am back to the old stuff for now. No. the jarred tamarind is not as good Nupur — but it does come in handy when I’m in a hurry 😉 You will love lotus root, I am sure! Lovely recipe which resembles banana stem a lot :):) Never tried as yet. You have a wonderful space with very interesting recipes. Linda , even I haunt the asian markets for banana stem like you.Does lotus root have that taste?I like the tamarind paste too,compared to the real thing the cost is a bit high.It does save time.You make your own dry chillies.Tussee great ho! I love the way you write about finding foreign stuff 🙂 I have seen banana stem in an international market here(mail it? 🙂 ). Banana stems are supposed to be very nutritious and help in weight loss. I hated them back home when they were plentiful but now I tolerate them. DH adores them, now that you have reminded me I will look for them. Linda, I love the banana stem in yogurt sauce (more-kootu) and I just said the same on banana stem juice. We dont get it here in TX.Never thought of using lotus stem. Does lotus stem hold the flavors well? I read that we have to use vinegar to soak them for a couple of minutes. Is that so? The sun-dried chilies look good. Hehe … lovely post Linda! I love the innovativeness, I am going to especially hunt for lotus root for your Not-a-banana-stem-curry! Glad you liked it, NY100 🙂 Thanks for stopping! Loved the title of your post. It manages to create a suspense as to what the food is about 🙂 Not sure why I never took a fancy to the lotus root. Your looks deliocious. Awesome recipe Linda! I remember eating lotus stems for the time at a Kashmiri friend’s house…they are so distinct in flavour, arent they? otus root is something I have not yet tried. ate it at a kashmiri friend’s house and loved it. I like this preparation would like to try sometime. 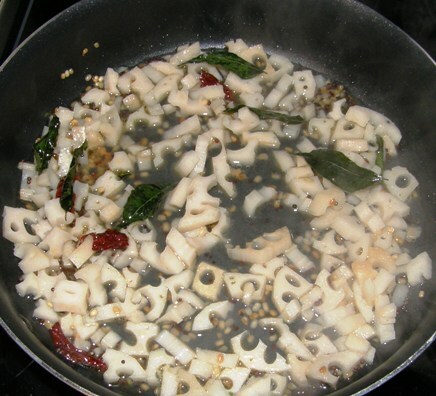 Sounds and looks delicious. I have a bottle of lotus stems in my refrigerator and I am wondering if I can replace the roots:). yummy. not i wish i wasn’t so lazy. i’d love to try this one dayin the future. You two, lazy? Never. I am thinking you commented in your sleep 😉 Nice to see y’all!